The Kentucky Derby was this past Saturday. I love going to our local horse racing track to watch the race. While the guys are worrying about which horses to place their bets on, the girls are admiring all the lovely outfits and hats. I saw a quote on Pinterest the other day that said, “if you’re not looking to stand out at the Derby, you’re doing it wrong.” Apparently, some ladies took that advice to heart. There were some fancy, fancy hats for sure! If people were dressed to the nines here, I can’t imagine what it must be like in Kentucky. Someday I’m going to find out, but this year I’ll settle for my hometown track. Also, for the first time this year, I decided to wear a hat. 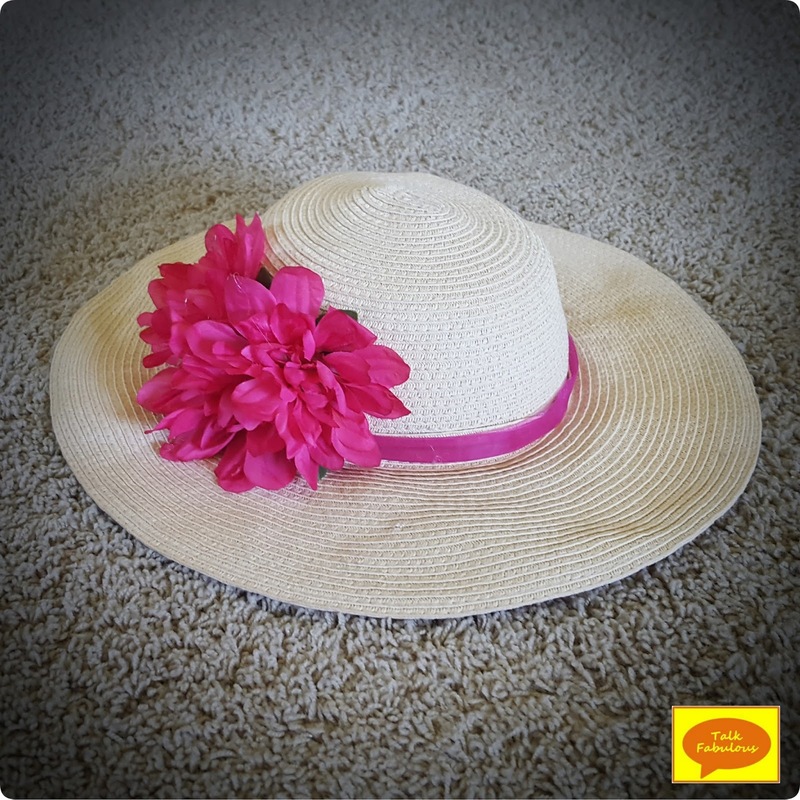 I decorated my straw sunhat for the occasion with some pink ribbon and flowers I found at the Dollar Tree. My hat looked like child’s play compared to some of the other hats I saw, but no matter. Now that I had the hat, I needed an outfit. I wasn’t feeling a dress, partly because I wasn’t ready to quite go all out. Maybe next year, though. As usual, I took to Pinterest to find some inspiration. I found this number tucked away in the depths of my Spring/Summer outfit board. I loved the bright colors and even though I didn’t have the exact pieces to recreate the look, it gave me an idea. 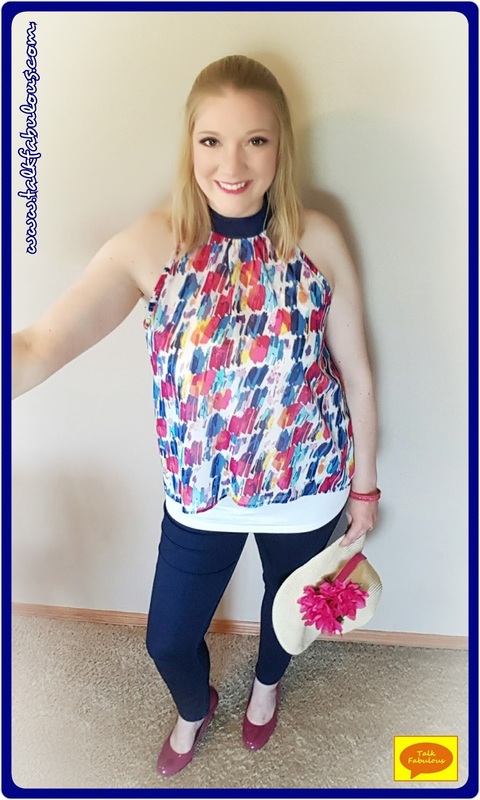 I paired a super colorful flowy top with a white tank, dark blue jeggings, and pink heels. I also threw on a white sweater for warmth. I ended up really loving this look! It was so fun dressing up and I was excited that my hat turned out so well! All and all it was a fabulous afternoon at the track! Have you ever been to the Kentucky Derby? Today, let’s talk repeating ourselves. Sometimes that’s super annoying, but when it comes to fashion it’s a good thing. Repeating outfits you love guarantees you’ll feel cool and confident all day long. So, why not do that more often, right? I love the scarf from the inspiration photo (see the original post here), so I decided to recreate the outfit. It was actually warm and sunny today (finally! ), so I opted to wear a short-sleeved white shirt, skinny jeans, and ballet flats. It’s hard to see, but I added some more bling with a necklace and some sparkly earrings. Although I love this look, I think it would’ve worked better had I switched out the skinny jeans for some bootcut ones. 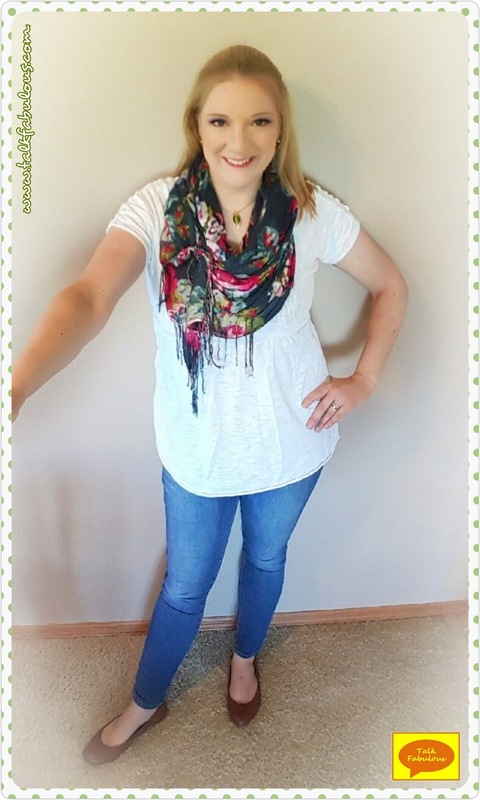 The flowy white top needs to be balanced with a wider pant leg. That’s okay; next time I’ll know. Happy May the 4th be with you day! Have you seen all the Star Wars movies? Confession time, I’ve only seen the first one. I know, I know, it’s crazy. Don’t worry, my bro-in-law is on a quest to remedy this unfortunate situation. I’ll keep you posted. In case you haven’t noticed yet, I’m a sucker for anything coral and that’s what drew me to today’s inspiration photo. On a side note, coral is a universally flattering color. If you haven’t worn it, I would highly recommend trying it out this spring. You won’t be disappointed! Now for the restyle. The white jeans are making a return. I still get nervous every time I wear them for fear something is going to stain them, but they’re so cute and perfect for spring. Putting my fears aside, I began recreating the inspiration photo. 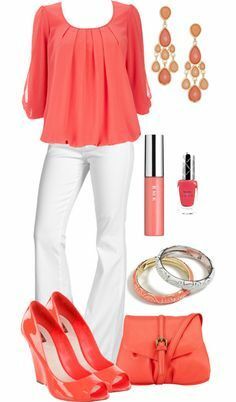 I paired a coral shirt with a white tee, the white jeans, and brown heeled loafers. To top off the look, I added some gold and coral necklaces since I didn’t have coral statement earrings as the inspiration photo shows. I also put my hair back in a headband, which is not something I do very often. However, sometimes it’s nice to break away from your normal, even if it’s just something small. Overall, I’m really loving the look! Provided I don’t spill anything on my white jeans, this is one that’ll be on repeat all spring! What’s your most flattering color? Today’s outfit features a new-to-me shirt from thredUP (stay tuned Friday for my complete thredUP haul). My original idea for the restyle was to add some statement necklaces as the inspiration photo shows. With the detailing on the neckline of the shirt, though, the statement necklace didn’t fit. Instead, I opted for some statement earrings. They might be difficult to see in the picture, but I promise they’re there. I topped off the look with skinny jeans, some heeled sandals, and a bracelet. Brown had never been a color I wore much until the last couple years or so. It’s a great neutral alternative to black, especially if you feel black is too harsh. Who knows, maybe brown really is the new black! We conclude the fashion portion of our Easter theme week with a formal outfit option. I love that this look is formal yet still fun. The pops of bright color give the look just the right amount of interest without being over the top. 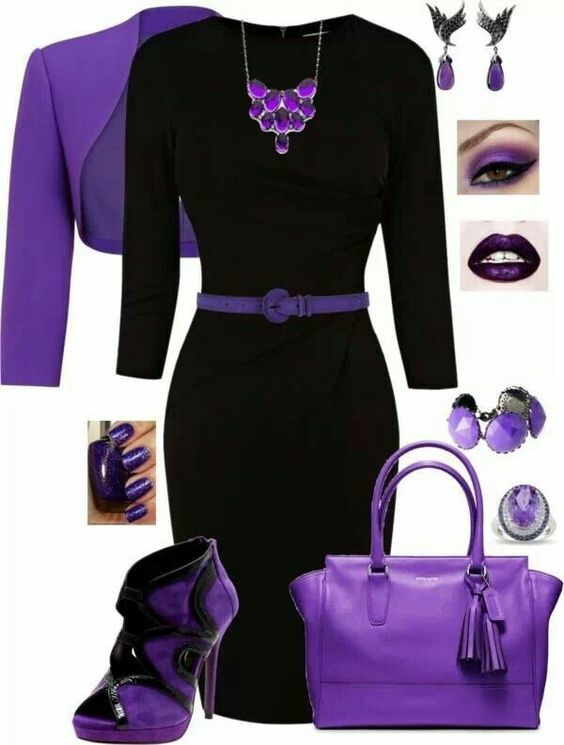 The inspiration photo shows every accessory in the accent color. My version is a bit more understated, but adding more pops of color is never a bad idea. 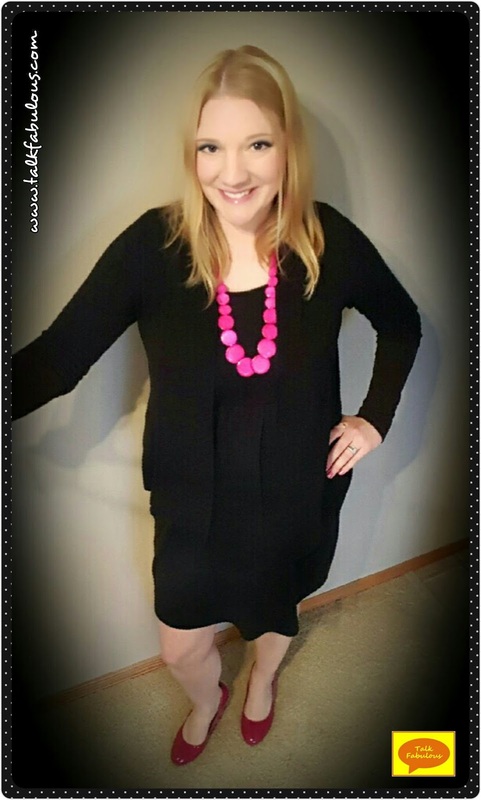 For my restyle, I chose a strapless black dress, a black sweater, a bright pink statement necklace, and pink pumps. To be honest, I planned to wear a bright pink shrug instead of the black sweater, but I completely forgot about it when I was assembling the outfit. The final look turned out nicely so I just went with it. If the weather is chilly, you could easily add leggings and/or some tall black boots. The black dress paired with just about anything will look nice. It’s basically a blank canvas. So go ahead, accessorize to your heart’s content! To recap our Easter fashion week, we’ve looked at a vacay dress turned Easter dress (see it here), a casual option for Easter Sunday (see it here), a half casual, half formal Easter look (see it here), and finally today a formal Easter dress. Which is your favorite? Would you wear any of these options for Easter Sunday? That’s all for today. See you guys in my next post where we conclude Easter theme week with some great Easter DIYs! Happy St. Patty’s Day Eve! Need to add some green to your outfit tomorrow? I have a great and easy idea for you, add a scarf! Not just any scarf, though. Accessorizing is all about fun, but adding the right accessories can make all the difference in an outfit. Take today’s inspiration picture. It’s absolutely gorgeous! 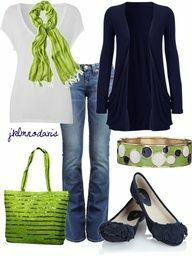 Navy and light green together are such a fabulous color combo. The problem lies in the styling of the photo. Look at the size of the bracelet compared to the rest of the items. It’s disproportionally large as the bracelet is the key piece that ties the whole outfit together. Without it, the ensemble is just a bunch of random items. In reality, if someone was actually wearing all these pieces, the bracelet may not even be enough to tie the look together. As you can see in the restyle, the outfit is not cohesive without that key piece. Very disappointing. 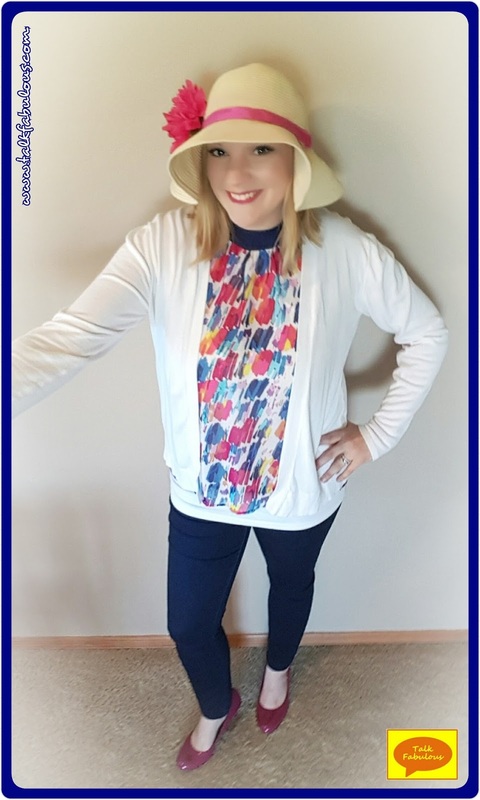 How would you restyle this outfit? Today, let’s talk simplicity. I love today’s inspiration outfit. It’s simple yet chic. You can’t go wrong with basic black paired with some skinny jeans topped off with some tall brown boots. That’s always a win in the fashion world! 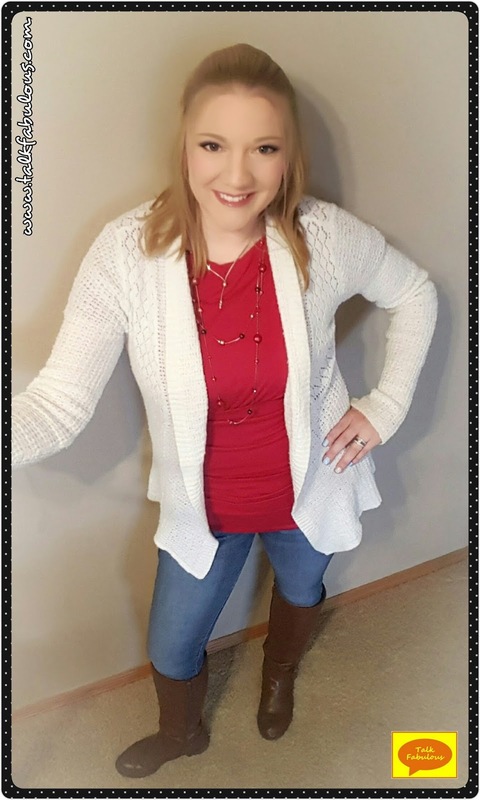 For my restyle, I wanted to add a little something extra while keeping the overall vibe simple and chic. 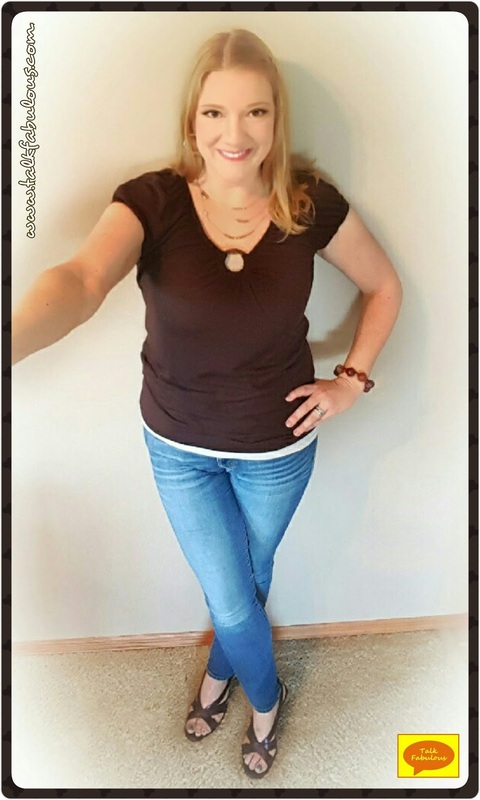 I opted for the same black shirt, skinny jeans, and tall brown boots. 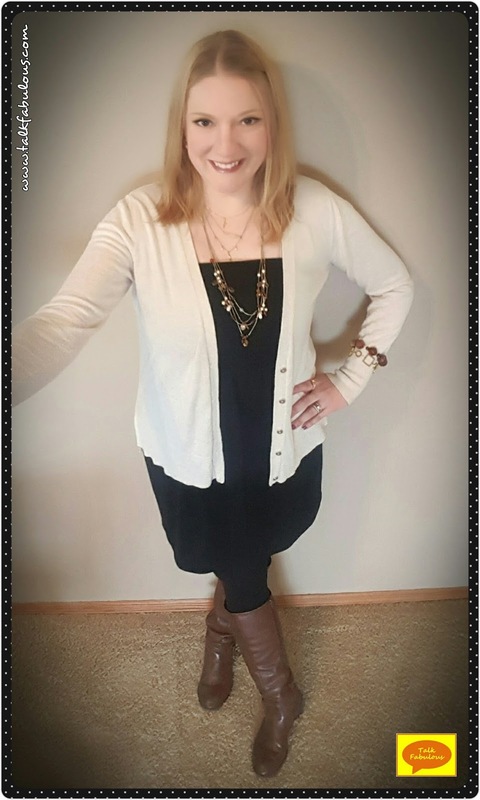 To boost the interest of the outfit, I added a long-length sweater, a funky yet simple necklace, a bracelet, and some hoop earrings. Honestly, I’m loving this look. Even better, it was so easy to put together! This is one that is sure to be on repeat! 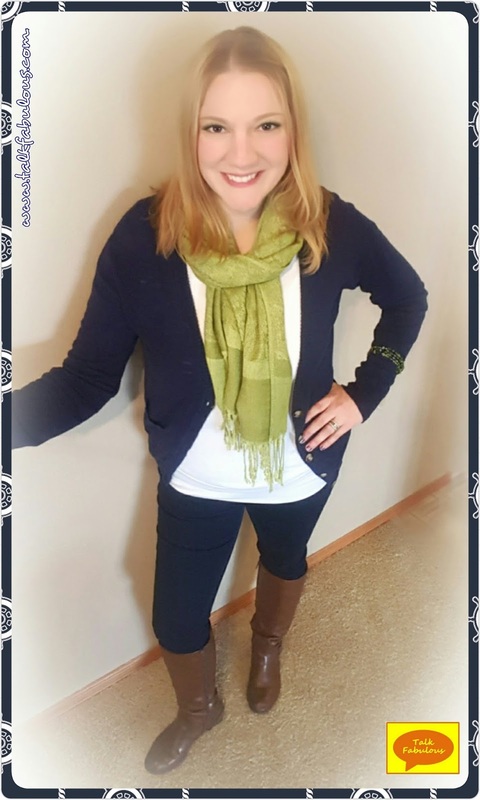 What’s your favorite way to add interest to an outfit? 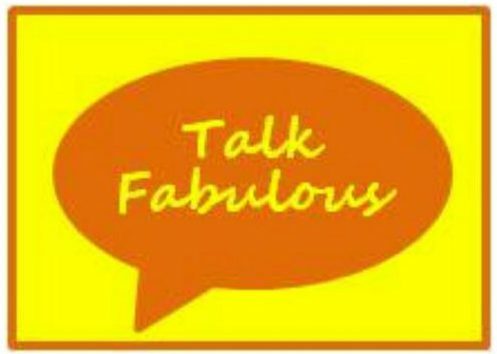 Today, let’s talk unexpected outcomes. I didn’t mean for this look to be so patriotic. However, it kinda turned out that way. That’s okay, though, because it’s not a bad thing and it gave the hubby the idea for the post title (thanks, hubs!). 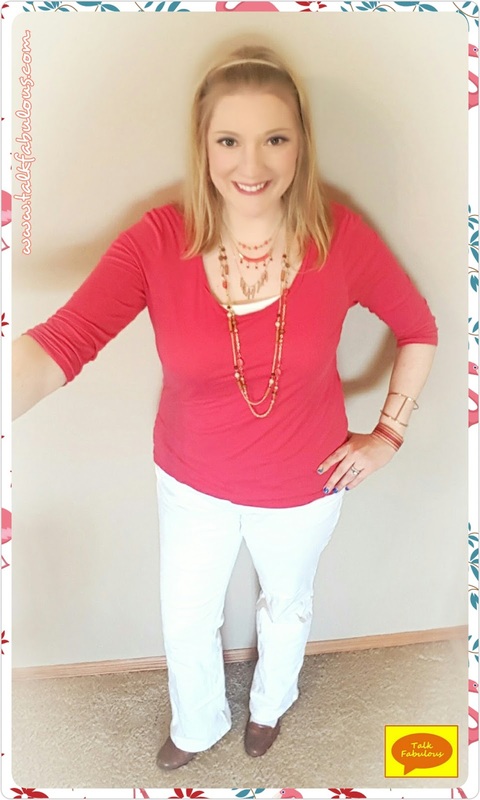 I love everything about the inspiration photo, especially the red with the layered necklaces. 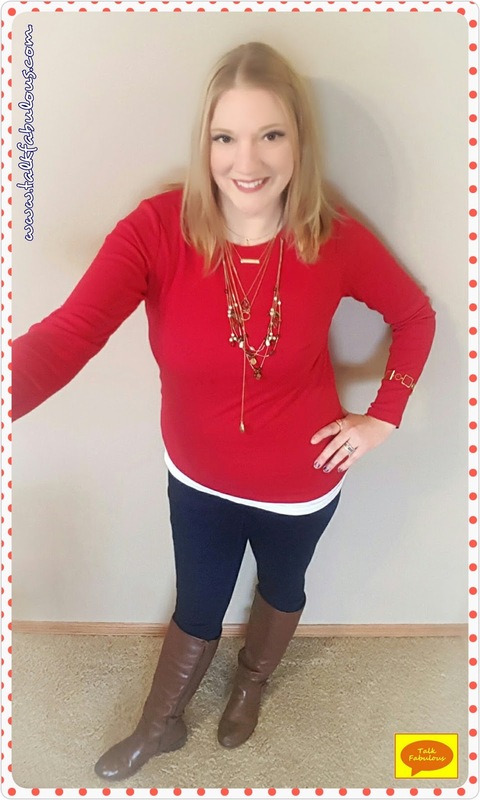 Since my restyle needed to be winter weather appropriate, I opted for a long-sleeved red shirt, a white tank, dark blue pull on jeggings, tall brown boots, a bracelet, and as many gold necklaces as I could pile on. I’m loving the look and I can’t wait to try the spring-like version sometime soon! Are you embracing the layered necklace trend? Apparently, it decided to be winter again here in the upper Midwest. The snow’s flying! Out of pure rebellion, I opted to wear a dress today. That’s right, I’m not going to let this snow dampen my spring spirit. The tall boots, leggings, and sweater add practicality to this otherwise warm-weather ensemble. The color palette also leans more toward winter. Although, it could go either way. The key here is in the accessories. 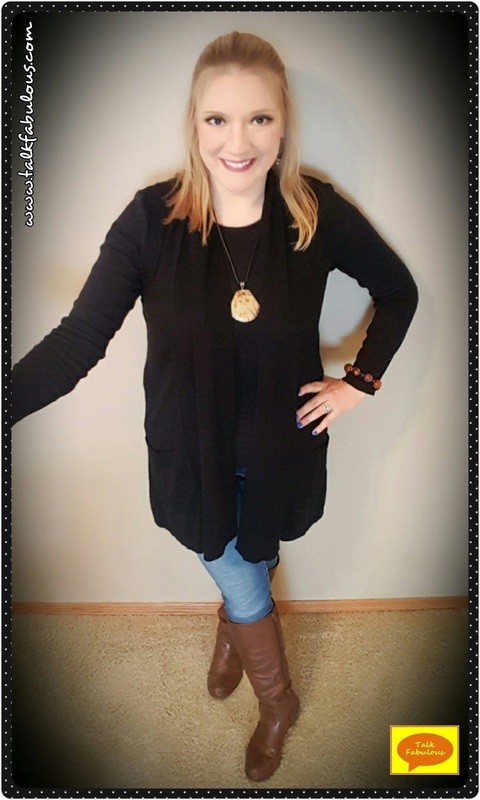 The inspiration photo pairs the outfit with a necklace that has darker neutral colors, as did I. This gives the outfit a wintery vibe. Add a necklace with lighter, brighter neutrals and you have an outfit ready for spring. That’s a big reason why neutrals are so fun. It enables you to play around with accessories and make them the star of the outfit. Who doesn’t love putting their favorite necklace in the spotlight, right? Happy March Madness! Is your team in?